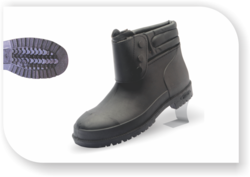 Pioneers in the industry, we offer rainy boot with polyvinyl chloride from India. Material : Upper made from superior virgin ﬂexible PVC for Comfortable walk and Hard PVC with cleated anti-skid sole with heel for better grip abrasive & Anti-penetration properties. Collar : Cushioned with soft imported Synthetic material. 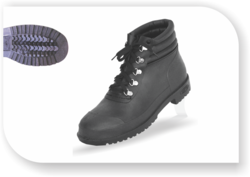 Steel Toe : With IS :5852 steel toe /200 J Steel Toe cap & without steel toe cap. Lining : 100 % Cotton for sweat absorbent & more comfort.